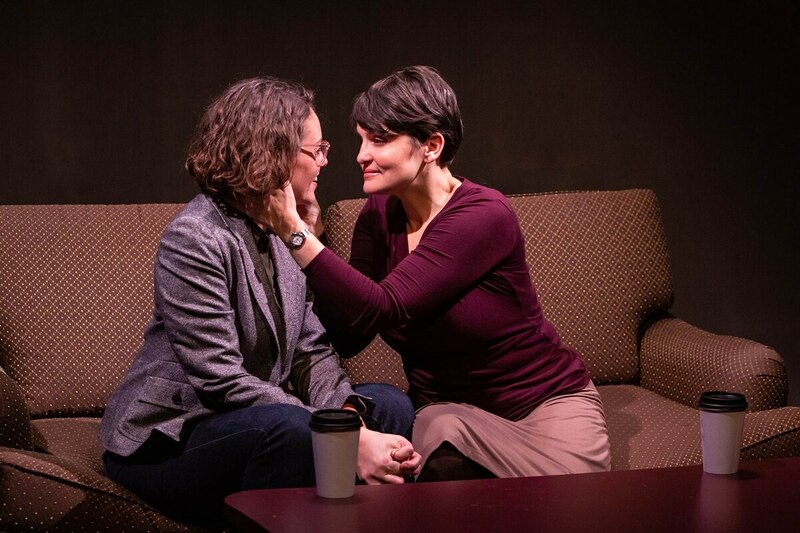 Love and war in the shadow of George W.
In one of the most romantic and haunting moments of Profile Theatre's In the Wake, two women cuddle while TV footage of politicians mulling an invasion of Iraq blares in the background. It is a magnificent clash of the political and the personal, of love and war. As history-making disasters take shape, ordinary lives unfold. Or at least that's one way of putting it. In the Wake, written by Lisa Kron, is the kind of play that leaves you bristling with doubt—the script is engineered to unsettle the upper- and middle-class liberals most likely to see it. Yet the production is also profoundly moving. In the Wake triumphs in both provoking and entertaining audiences thanks to a crack cast of actors who accentuate Kron's best ideas and valiantly smooth over a few weak ones. The play begins on Thanksgiving Day 2000. Ellen (Beth Thompson), a New Yorker who works several jobs, is watching the convoluted saga of the Florida vote recount unfold on television. She lives in a constant state of feverish indignation, much to the annoyance of her partner, Danny (Chris Murray), as well as Danny's sister Kayla (Danielle Weathers) and her wife, Laurie (Alissa Jessup). But politics turns out to be just one part of the play's vast narrative matrix. As the country changes—footage of George W. Bush, Hurricane Katrina and much more is projected across the set to signal the passage of time—Ellen begins an affair with Amy (Jamie M. Rea), a filmmaker whose romanticism clashes with Ellen's intellectualism in ways that are alternately exhilarating and heartbreaking. If Ellen enjoys a cozy cloistered life with Danny, and Kayla and Laurie echo the comfort of her partisan politics, it's Amy's fearsome emotions that represent the possibility that Ellen might embrace a more enlightened, less rigid worldview. That idea is beautifully reflected in director Josh Hecht's evocative staging. While every scene between Ellen and Danny takes place within the walls of their apartment, a bed where Ellen and Amy make love is placed at the edge of the stage against a dark backdrop, like a spaceship voyaging into the unknown. It's a journey made fascinating largely through Thompson's multifaceted performance. She often speaks swiftly, bringing machine-gun intensity to Ellen's rants about 9/11 and Karl Rove. Yet Thompson also emphasizes Ellen's self-conscious side, which emerges when she sheepishly utters self-deprecating lines like, "Wow. I talk a lot." The play's attempt to probe Ellen's lack of confidence isn't always successful. In the Wake occasionally feels less like a play than a device created to reveal the hypocrisies behind Ellen's ideals. There are times when the other characters seem to exist mainly to question and shame her, which injects an unwelcome didactic tone. Yet even when In the Wake falters, it doesn't lose you. The play's meditation on the ongoing American war of blue versus red is timeless, but the story's true power lies in its fusion of intimacy and grandeur. Ellen and Danny's apartment may be cordoned off from the world, but in a way, it is the world—an arena where passions, ideas and vulnerabilities are laid bare, leaving us to wonder if we have more in common with Ellen than we would like to admit. Lisa Kron's In the Wake tackles one of the 21st century's most combustible topics: the 2000 presidential election. WW spoke to her about the play, its relevance in 2018 and its divisive heroine, Ellen. WW: Why were you interested in the concept of ideological or emotional blind spots? Lisa Kron: I was appalled by what was happening in the George W. Bush administration and around the 2000 election. But I also just had this feeling that it couldn't just be the Republicans. It made me wonder, "What are we not seeing?" How much of the play comes from you personally and how much comes from the characters? The play is a dramatic construction that is made to examine the places that politics and identity or psychology or personal history intersect. Certainly, the political questions were questions I was having and continue to have. Do you think people sometimes approach In the Wake in the wrong way because they are a little bit afraid of the questions it brings up? Ellen is trying to understand something about the blind spot that comes from centrality. If you see yourself as the center of the world, then you're only looking out—you can't see yourself. SEE IT: In the Wake plays at Artists Repertory Theatre, 1515 SW Morrison St., profiletheatre.org. 7:30 pm Thursday-Saturday and 2 pm Sunday, Dec. 6-16. $20-$36.